L to R: Angela Isaac, Ph.D., Thomas Isaac, M.B.A., M.Ed., Robert Skertich, Ph.D., and Thomas Cook, M.B.A.
Rowland School of Business faculty members Angela Isaac, Ph.D., Robert Skertich, Ph.D., Thomas Cook, M.B.A., and Thomas Isaac, M.B.A., M.Ed., were involved with Allegheny County Fire Academy training sessions Jan. 27. 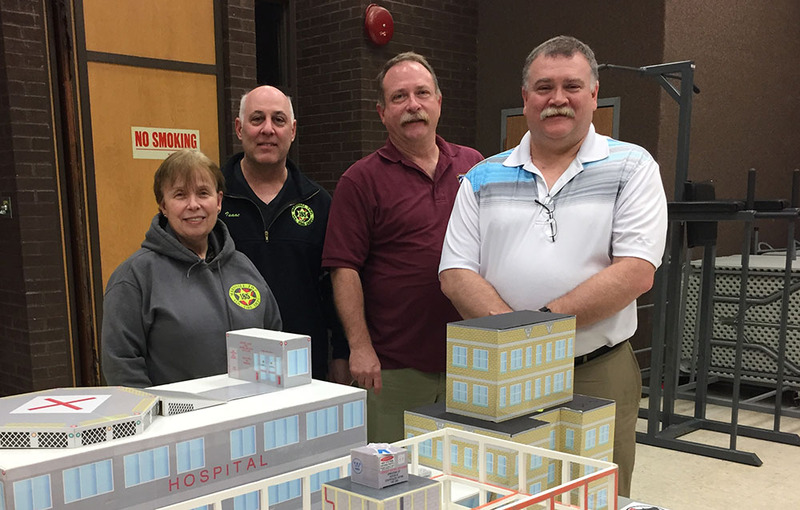 Angela Isaac, an exterior firefighter for the Marshall Township Volunteer Fire Department in Wexford, Pa., and Tom Isaac, assistant fire chief of the Marshall Township Volunteer Fire Department, participated in a full-day training session on Incident Command System Tabletop Exercises. Skertich and Cook led a full-day training session as part of the 40-hour Fire Service Instructor I Certification Program they are teaching at the Academy. Both adjunct instructors for the Pennsylvania State Fire Academy, Skertich is also a firefighter and rescue technician for the Elfinwild Volunteer Fire Company in Glenshaw, Pa., and Cook is assistant chief of operations for the Pittsburgh Bureau of Fire. "It was great to have Point Park University faculty represented at the Academy who are actively engaged in the fire service community," said Angela Isaac. Explore the undergraduate and graduate programs in the Rowland School of Business including the Bachelor of Science and certificate programs in public administration. Additionally, concentrations and minors are offered in EMS administration and fire service administration. Request information or apply online.